Here is an odd little bug that was discussed a couple of weeks ago on the OTN forums. It's about queries on join views by ROWID that fail with "ORA-01410: invalid ROWID" under certain circumstances. The bug can only be reproduced when using the 11.2 code base. In fact the same setup will cause an internal error in 11.1, but 10.2 will return correct results. It's probably not a very common scenario but it is an interesting example of how features that work fine by themselves can cause problems when used together. First of all (hopefully) some of you may ask: How is it possible to query from a join view by ROWID, since the view is based on multiple objects and hence doesn't have a simple one-to-one mapping to a ROWID of a single table? There is a lot more to say about Dynamic Sampling and indexes, and I'll try to cover these basics in my Dynamic Sampling series on AllThingsOracle.com, but two recent discussions on the OTN forums and on Charles Hooper's blog prompted me to publish this blog post. This is just a short note that Oracle has added several nice details to 11.2.0.1 and 11.2.0.2 respectively that can be helpful for troubleshooting. Since 11.2.0.1 the V$ACTIVE_SESSION_HISTORY view (that requires Enterprise Edition plus Diagnostic License) contains the PGA_ALLOCATED and TEMP_SPACE_ALLOCATED columns. In particular the latter closes an instrumentation gap that always bothered me in the past: So far it wasn't easy to answer the question which session used to allocate TEMP space in the past. Of course it is easy to answer while the TEMP allocation was still held by a session by looking at the corresponding V$ views like V$SORT_USAGE, but once the allocation was released answering questions like why was my TEMP space exhausted three hours ago was something that couldn't be told by looking at the information provided by Oracle. Most execution plans can be interpreted by following few basic rules (in TOP, Chapter 6, I provide such a list of rules). Nevertheless, there are some special cases. One of them is when an index scan, in addition to the access predicate, has a filter predicate applying a subquery. Fedora 16 came out yesterday and since it’s my main server OS it’s been upgrade crazy round here. All new installs and upgrades were straight forward. No real dramas at all (touch wood). As usual, I’ve done the OS installation and Oracle installation articles. 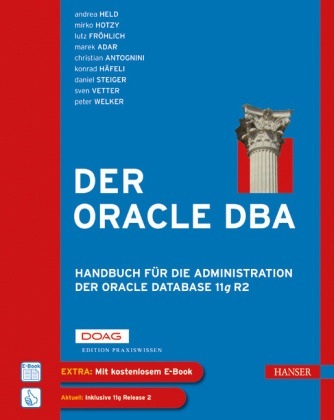 The book Der Oracle DBA (Hanser, 2011), which was written in German, is at last available! I say “at last” because the authors worked on this project for not less than two years.